We are thrilled that you’re interested in volunteering at Project Angel Heart! Please fill out the following Volunteer Application to register for a New Volunteer Orientation session (dates are listed in the drop-down box at the bottom of this page). The orientation provides information about Project Angel Heart and details our volunteer positions. After you attend a New Volunteer Orientation, you will have the opportunity to sign up for volunteer positions based on your schedule and current availability. Please note that certain volunteer roles will require you to submit a background check (instructions will be provided at orientation). Please review our Background Screening Policy for more information. Many companies and employers make a contribution to agencies for hours their employees volunteer in the community. We do not contact your employer about your volunteer efforts with us. This information is helpful for grant purposes, but is not required. Your confidentiality is important to us. 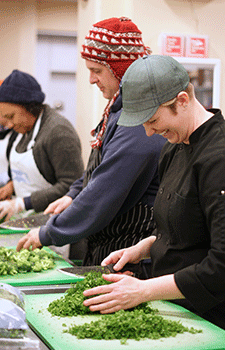 Does your employer offer days of service to volunteer in the community? We truly value each volunteer's experience. We are better able to serve our volunteers and ensure a positive experience by encouraging an open dialogue with our Volunteer Resources Team. Please note that by signing up for volunteer orientation, you agree to receive periodic email newsletters and updates, including information about volunteer opportunities and events, from Project Angel Heart. You may unsubscribe from these emails at any time.